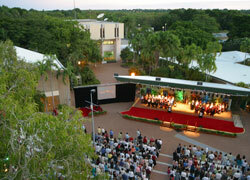 Graduation ceremonies will take place tonight and Friday night at the Casuarina Campus of Charles Darwin University starting at 6.30pm. 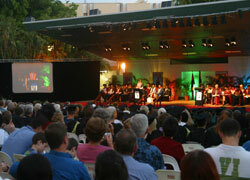 A total of 2467 students will graduate in the May graduations. Over 670 CDU students will attend the graduation ceremonies during the two ceremonies in Darwin this week and at a similar event in Alice Springs on 16 June. Professor Don Aitkin AO, a former Vice Chancellor at the University of Canberra, will give the Occasional address to graduands tonight and on Friday the address will be given by Sue Nattrass AO, Director of Federation Square, Melbourne. To celebrate students' success there will be a fireworks display from 8.15pm on Thursday 25 and Friday 26 May at Casuarina Campus. The fireworks can be viewed from Alawa Oval (near the Alawa Scout Hall).